The term "car detailing" has been widely used in America for some time but it is still not often understood in the UK. To confuse matters, an ever increasing number of companies are using the term simply because they sometimes polish (mop) a car or offer valeting. Car detailing really isn't defined by one single process but is instead a term that covers a wide variety of techniques and products which, to get the best results, require considerable skill to apply. A valeter may get your car clean by typically spending an hour or less on it and a bodyshop may quickly run a polisher over your car to remove a few marks, but neither can be classified as detailing. 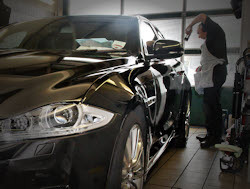 By combining our extensive experience with a well ordered and practiced approach to car detailing and ensuring that we have researched and tested every product, we are able to guarantee the highest quality results. Every car is different, but in general, a thorough detail will leave just about every surface of the vehicle improved; from beautifully glossy and slick feeling paint to UV protected, low sheen rubber and vinyl, cleaned and conditioned leather and sparkling chrome. The difference is dramatic and not one that can be achieved by valeting. When you consider how expensive it would be to respray your car, detailing represents very good value for money. We can preserve the original paint while often achieving amazing results.